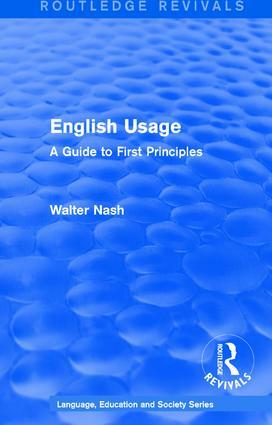 First published in 1986, this book examines the changing patterns in English usage and style. It encourages a constructive attitude to language, demonstrating the creative resources of grammar, discussing in detail the options of written style, and challenging the authoritarian spirit that inhibits usage. The central chapters are concerned with written usage, and pay close attention to questions of syntax and punctuation. The sense of writing, however, is always related to speech, and the value of usage as a social act is emphasised in the exploration of style as an individual function. Technical terms are explained and the text is illustrated with examples from literature and journalism. First published between 1985 and 1987, this set of books attempts to tackle some of the complex issues implied by the title Language, Education and Society. For example how is language related to learning? Or to intelligence? Do regional and social accents and dialects matter? What is meant by standard English? Do immigrant children require special language provision? Why are there so many adult illiterates in Britain and the USA? Although the importance of language to education is agreed there is still a lot to learn about how language is related to either to educational success or to intelligence and thinking — both fields to which this collection contributes valuable research. Some of the specific topics the covered by the wide-ranging and insightful research contained in this series include: an analysis of the school teaching of mathematics from the perspective of mathematics as a language — principally how the processes of communication in a maths classroom are shaped by school conventions and the fact that it is mathematics under discussion; an examination of the changing patterns in English usage and style, especially written usage — focusing on questions of syntax and punctuation — and how this relates to speech and the value of usage as a social act; an exploration of the history and impact of mass literacy on industrialised societies, how this differs from traditional oral culture, and the effect of a culture where most people rely on complex combinations of oral and literate communication on a sizable sub-literate minority; an investigation into which languages are in widespread use among children and adults in England, the patterns of language use in different social contexts, the teaching of community languages inside and outside of mainstream schools, and the educational implications of this linguistic diversity for all children. This set will be of interest to educational researchers, sociologists and students of sociolinguistics.